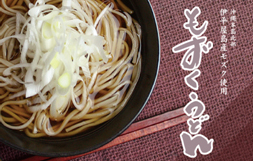 “We want to share the merits of Okinawan mozuku”Our noodles are made with such a desire. Focusing on the slippery texture peculiar to mozuku, we were committed to the manufacturing method, material and texture of mozuku udon(noodles). 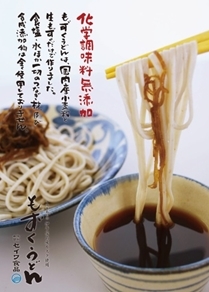 The ingredients of the noodles are only raw mozuku produced in Okinawa and wheat flour produced in Tokachi, Hokkaido. No salt is added. leading to the smooth and springy texture peculiar to mozuku udon. The noodle broth is made from carefully selected kelp broth produced in Hokkaido and a great amount of kelp powder without any chemical seasoning. Noodles become more delicious when eaten with the broth. wheat flour and raw mozuku produced in Japan. Raw mozuku makes up about 30% of the noodles. Low in calories and very nutritious. Kelp broth with plenty of deliciousness. Children enjoy eating a lot of noodles. Both cold and hot noodles are delicious. The noodles have an expiration date of about one year at normal temperature. No preservatives or chemical seasonings are used. Uses raw mozuku produced in Okinawa. Uses wheat flour produced in Tokachi, Hokkaido. Boil noodles in plenty of boiling water for ten minutes or until noodles are cooked to your taste. Wash noodles with water to cool them down. Hot udon Eat it with broth diluted with hot water (400 - 500 ml) to one bag of noodle broth (80 ml). Cold udon Eat it with broth diluted with water (100 - 200 ml) to one bag of noodle broth (80 ml). Noodles become more delicious when eaten with green onion, Japanese horseradish, mozuku or Okinawan red pepper as desired. Mozuku is one kind of seaweed, which has been eaten in Okinawa for a long time as vital longevity food. In particular, Okinawan mozuku is characterized by its thickness and chewy texture and contains minerals and a lot of nutrients. Take the amount of noodles you wish to use on a bamboo sieve and wash them by hand two or three times. 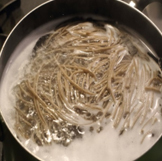 Put the sieve with noodles into a bowl and leave them under running water for about 8 to 10 minutes. After a short while, mozuku expands. After tasting one or two noodles, if they don't taste salty, drain the water to prepare the noodles. Eat them in various dishes such as vinegared dishes, salads, tempura, miso soup or other soups. Mozuku that has had its salt removed can be stored in the refrigerator for about 1 week and in the freezer for about 1 year. Storing in small quantities in the freezer is recommended for easier cooking. Calcium is effective in the prevention of osteoporosis and reduction of stress. Mozuku contains 100 mg of calcium per 100 g, similar to milk. Magnesium regulates the absorption of calcium and is a vital mineral which should be consumed with calcium to adjust balance. It’s a type of vitamin. Insufficient folic acid causes anemia or depression. The folic acid facilitates synthesis of red blood cells, prevents arteriosclerosis and ensures the health of mucous membranes. In particular, it’s a vital vitamin for pregnant women. It is the slippery ingredient of mozuku which comes together with sodium (salt) and aids in expelling extra sodium from the body. It is also considered to be effective in reducing bad cholesterol and relieving swelling. It has recently attracted attention due to its cancer suppression effect. Like alginate, it is one of the slippery ingredients of mozuku. It is no exaggeration to say that it is the most important nutrient in mozuku. Fucoidan provides many effects as follows. Preventing obesity and diabetes, anticancer effect, preventing constipation, preventing ulcers, recovery effect, low-cholesterol effect, increasing good cholesterol, and intestinal regulation effect.